Now, I know how many people there are out there that are big "cry it out" supporters and I want to make sure you know ahead of time that I am NOT knocking you or disagreeing with you! I just believe that every family has to do what is best for them. 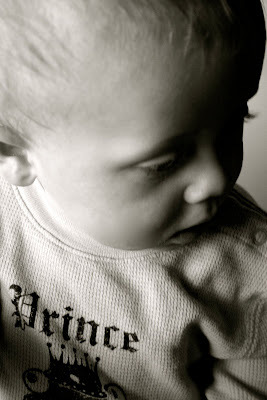 Before I had Aiden I thought I would be one way...and in many ways have surprised myself! 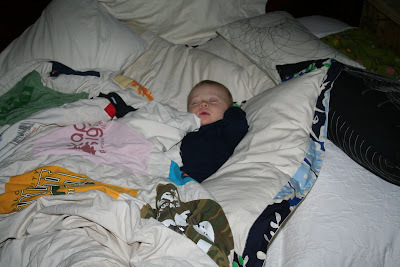 For some reason many people who support co-sleeping aren't very open about it....it seems at times a bit "hush, hush". In my case I guess I am somewhat scared I will get some sort of lecture. So I have felt the need to tell our story and some stats! Co-sleeping is actually the norm in most other countries. In fact, the idea of babies sleeping in their own cribs was really only introduced 200 years ago. (In other countries cribs are referred to as cages!) America remains the only place in the world where placing a child in his own bed in his own room is the norm. In more than two -thirds of the cultures around the world, mothers sleep with their infants and statistics show that over 70% of families share a bed with their young children in one way or another. In countries where co-sleeping is the norm (that is, almost every other country except the United States) SIDS is unheard of and breastfeeding is far more successful. With Aiden, he will choke, sweat, scream, get sick, gag and cry like you would not believe. It would be one thing if my little man cried for a couple minutes and fell asleep or whimpered awhile but this is far from the case. I just feel like it couldnt be the best thing for him when he is reacting this way. Now, in no way do I want a TODDLER still sleeping with us and yes I know you have to start as you mean to go on...but for now it works and we will take it a day at a time. When I imagine the beginnings of time...when God first created everything...I imagine these little babies being cuddled, nurtured and loved on by their parents all through the night. Did you know? While co-sleeping, the baby and mother's breathing will often be in sync, encouraging the baby to breathe better. Babies who co-sleep usually grow up to be well-adjusted and independent children. They know that they can count on their parents to be there and develop a close relationship with them. Studies have also shown that these children tend to do better in school. Anyways, co-sleeping isn't for everyone and I get that. It might not be the best thing for us even with every child BUT I do think criticism and embarrassment can sometimes be associated with cosleeping....so I am putting myself out there for those who support it. This is my happy little man this morning...sound asleep till EIGHT AM! Because he was with mama and dad :)! Good for you Casey... you know what is best for your lil man!! He looks very cozy!! :) Merry Christmas!! love it. i think it is so great what yall are doing mainly because you are doing what works for YOUR family! that is the main thing in parenting, i think. LOVE YOU and your little man. You go, girl! Totally agree that you gotta do what works best for your family...I still feel like I'm trying to figure that out most days! HA! I don't think anyone should feel guilty about co-sleeping or weird about it! casey, not that i'm a mama yet, but all of my friends in Seattle sleep with their little ones for awhile and it seems to be a beautiful, very normal experience. plus, being in a psychology program, there is sooo much support for this. i think some of american culture has been much to the detriment of child rearing due to this need to make our kids almost bionic, needless, as well as seeing human nature as manipulative--and i think to be needed can be an exhausting experience where it is far easier to pull away from our kids than to pull closer with recognition of yourself and your needs as well as your kids and their needs. ok ok ok i'm done. i'm glad you're open about this and hope the transition brings strength and peace to your family amidst the anxiousness and disruption of separating. Casey-I LOVE this post!! Would you mind if I posted a link to it on facebook? I feel like you put into words exactly how William and I feel, but if you'd rather me not that's totally fine! We're praying hard for you guys and sweet Ansleigh(and Aiden as he transitions to big brother)-Can we bring a meal or something to you guys this week?